Due to the overwhelming response on the first end-of-regular season Boston Bruins prospects deep dive I did on Friday, I’m back with another iteration. I’m limiting these to five players maximum, not only because they can get pretty unwieldy in terms of reading with 2,000+ words a pop, but because they take some time to put together. If you don’t see the B’s prospect you’re most interested in, hang in there- I will get to every one of them between now and the next 1-2 weeks when the CHL and NCAA playoffs begin in earnest. Everything will build towards and culminate in an end-of-season ranking- similar to the one I did in the January issue of New England Hockey Journal. So, without further ado- here’s the second deep dive. As always- appreciate the support and feedback. The undrafted free agent from East Longmeadow, Mass. left the University of Massachusetts after his first full season nearly a year ago to sign with his childhood favorite Boston Bruins and became the Cinderella story of the 2015-16 hockey season. In the span of a year, Vatrano reshaped his physique, tore apart the AHL with a four-goal game and multiple hat tricks en route to a goal-per-game performance (he’s cooled off a bit of late and “only” has 26 goals in 27 AHL games), and then earned his first NHL opportunity, debuting against the Montreal Canadiens at the Bell Centre and netting his first big league goal. He would eventually score his first NHL hat trick against Pittsburgh later on and although he was optioned back to Providence, he’s shown immense promise going forward. Since his days in minor hockey and the Boston Jr. Bruins (as well as two years with the U.S. National Team in Ann Arbor), Vatrano has been a goal scorer. He’s long had an NHL release, which he showed off in dazzling fashion during the exhibition season last fall and then proved it was no fluke when he began terrorizing AHL goalies with Providence to begin the year. He has a natural nose for the net and sublime hands, which allow him to exploit gaps in defenses and find open spaces where he can get his heavy, accurate shot off with a minimal amount of time to work with. Vatrano is a born shooter- he generates a tremendous amount of torque and power on his shots and can pick the corners at will. He also has superior reflexes and hand/eye coordination to get his stick on shots for deflections and batted pucks into the net. Not tall and with a naturally stocky build, Vatrano dedicated himself to improving his conditioning in the offseason after seeing a few games in Providence at the end of the 2015 campaign (5 games- 1 goal) and having a “come to Jesus” with the Bruins in his exit interviews. The results were staggering, as he not only saw the improved ability to take extended shifts and recover faster, but also picked up some speed and quickness in his first few steps. He’s got such a good hockey IQ that he can recognize developing plays well and explodes to the puck in just a few strides. His defensive game is still a work in progress, but there is no denying that the will is there. He often hustles on the back check and has shown impressive open ice speed in winning foot races back to his own end for loose pucks. He’s one of those players who was previously asked to go out and score, so it’s not a question of whether he’s committed to playing more of a complete game, but just getting him the experience and situations that will allow him to be more effective when he inevitably returns to Boston for his next chance. Current assessment: Vatrano is the top prospect in the pro ranks in the B’s organization. He’s proven that he can find the back of the net in the AHL and NHL and at this point is better off playing an extended role in Providence as a first liner and top power play ace. His 38 points in just 27 games in the AHL shows a dominance at that level that nobody, even his most ardent supporters, could have predicted at this time a year ago. Vatrano is a good kid (he turns 22 in a week) who is living the dream of being a Boston Bruin- he played at the Gillette Stadium in the 2016 Winter Classic- and is sure to build more experiences and memories. The good news for the B’s is that their offense has not been an Achilles heel this season, so Vatrano can spend more time getting the development in seasoning he needs rather than being more of a spare part and lower line option in Boston. This sets the conditions for him to go in and earn a top-9 NHL billet and gives the team some options to perhaps make some critical moves on defense by leveraging roster assets, knowing that players like Vatrano are in the system and could be ready to make the full-time jump next fall. Statistically speaking, it’s been a disappointing year for Boston’s top pick last June (13th overall- acquired with the draft choice that sent Milan Lucic to Southern California). A brutal start in September and October put the Czech native behind the 8-ball and while he’s shown improvement in his all-around play since he returned to the Saint John Sea Dogs from the World Jr. Championship in early January, there’s no getting around the fact that the production isn’t where it should be for one of his talents. On the plus-side, Zboril has the physical attributes of the prototypical modern NHL defender: Good size, superb skater with a powerful stride/quick first few steps and an impressive glide, hard, heavy shot. He has the natural vision and instincts to be a two-way threat and power play quarterback where he uses his agility to navigate the offensive blue line with ease and fires pucks to the net. Physically speaking, Zboril plays the game like a North American player- he’s known for throwing big hits and getting extra shots in (that often earn him extra time in the box). He’s obliterated surprised opponents in the past who made the mistaken assumption that Zboril was a soft Euro and dropped the gloves only to find they had a tiger by the tail. All of these traits should endear him to the Bruins and their fans- it’s precisely what the team needs most in terms of upgrading the NHL roster’s blue line. However, many things in life are rarely so simple as that, and in Zboril’s case- there is more nuance here than meets the eye. Even when he was rising on the team’s radar last year as the first of the second tier of defenders available in 2015 (it’s not really a secret that the Bruins coveted Noah Hanifin and Zach Werenski and tried unsuccessfully to maneuver themselves into the top-5 and 10 to get one of the two) that Zboril came with some warts. Even though the B’s jumped on him with the first of three consecutive picks, his natural effort levels and compete were a question mark. What’s interesting to me is that in some circles, Zboril was given high marks for his work ethic and hustle, but when I broke him down in film study, I saw a player who went through stretches of passive, even disengaged/uninterested play. Often times- that’s a simple thing: ineffectual waving at a forward as he skates by in the lane instead of gapping up and forcing him wide or disrupting his speed/momentum with body contact. Current assessment: This season, the shift-to-shift inconsistency and wavering intensity levels have been more of the same with Zboril, unfortunately. He will demonstrate immense promise on one shift, revving up with the puck in his end and blitzing through the neutral zone to fire a shot on net or dish to a teammate in prime scoring position. Or, maybe it’s closing quickly with an opposing puck carrier and knocking him on his keister with a solid body check or deft poke check with his stick. But then a few shifts later, he’s gliding around, not asserting himself or taking advantage of opportunities to push the pace or impose his will in the same way. The good news is- he just turned 19 at the end of last month and there is time for him to mature and develop more of a consistent game with coaching and experience. The question is becomes, however- does Zboril have it in his intangibles to be the player he *could* be given his prodigious natural gifts? That’s the proverbial $64,000 question, and why drafting and player development is an inexact science. On pure ability alone, Zboril could have been playing in Boston this year, but he’s got more work to do at developing his positional play and of course- on the aforementioned intangibles. It’s no accident that the B’s tried to move up last June to take someone else- they likely saw the same things. Zboril is one of those boom-or-bust players and the reward with him could be key in the next 1-3 seasons, but just as the team has the responsibility to work with the player to put him in a position to succeed within the organization, the player also needs to raise his compete and do what is asked of him. There is no doubt that Zboril should have been a first-round pick last June and that the B’s not only upgraded their prospect pool at the defense position with him but brought in the kind of high potential player you want as opposed to a safer but limited upside option. It is a bit intriguing that the B’s could have drafted Zboril’s Sea Dogs teammate Thomas Chabot instead (he went a few picks later to Ottawa) and Chabot is having a far more impactful season as Saint John’s No. 1 D, but that’s water under the bridge. Woulda, coulda, shoulda- if if’s and but’s were candy and nuts it would be Christmas every day of the year. What happens with Zboril going forward will be interesting to watch. Unfortunately, as a 1997-born player drafted out of the CHL, he either makes Boston’s roster next fall or has to go back to the QMJHL (or he could opt to play in Europe) but AHL and Providence is not available to him as a developmental path in 2016-17. 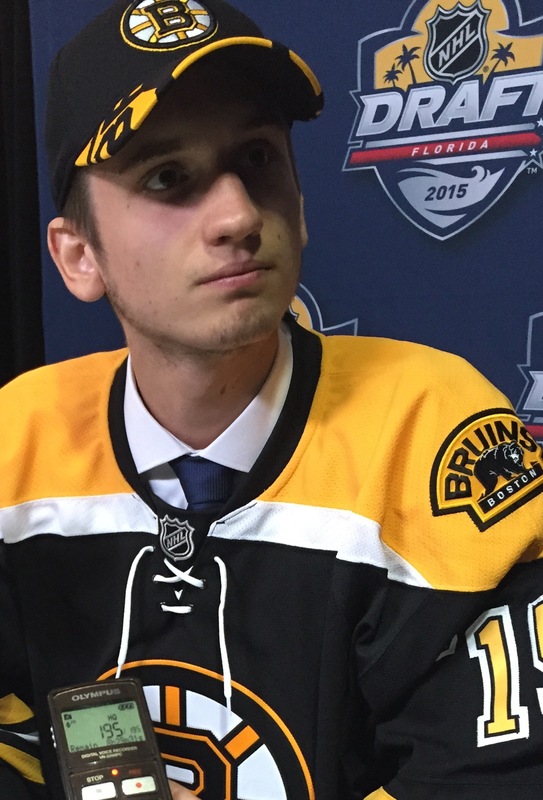 Taken with the 45th overall selection last June, “JFK” is one of the two second-rounders the B’s got from Calgary in the Dougie Hamilton trade (Senyshyn and D Jeremy Lauzon round out the three-pick haul for Boston) has been one of Boston University’s top adds this season. He’s coming off a two-game sweep of UMass, the second game of which he scored a pair of goals and added an assist, which brings him to 9 goals, 28 points in 36 games for the Terriers as a freshman. He’s fourth on the team in scoring- tied with senior Matt Lane in points but Lane has 14 goals. JFK has come as advertised this season: he’s a smart, smart player who brings a polished, advanced game for one who only turned 19 in the fall. He’s a good skater- quick to accelerate and smooth in the open ice. He’s faster than he looks, but doesn’t bring an electric presence with his skating. Often times- he might appear to be kind of gliding and coasting, but then he’s used that rangy, loping stride to slip by the defender at the blue line and is making a pinpoint pass to set up a scoring opportunity. The Stockholm native, who spent two seasons in Nebraska playing in the USHL at Omaha getting used to the smaller ice surface and more rugged, physical nature of the North American game, has what scouts call 360-degree vision. That’s the rare ability to not only see the entire play in front of him, but also a penchant for understanding what is behind him and on the periphery, so he often makes flawless drop passes or dishes that many other players simply aren’t capable of executing. He is most often compared to (by others I would point out) Patrice Bergeron, but while that’s a valid style comparison, I don’t think he’s as heavy on the puck at this stage of his development as Bergeron was even at a young age. However, the smarts, attitude and general ability to excel in all three zones appears to be there and JFK quickly earned David Quinn and his staff’s trust this year. JFK was knocked in junior hockey for not playing with a lot of pace and urgency, and I can see those observations at times with BU this year. He’s not a player who is buzzing around the zone the way other high-energy forwards do, but he’s an economy of motion type who has the hockey sense and skill set to do a little more with less. It’s not going to win him many style points, but it’s effective. He’s slick and creative- your mind starts to wander a bit in terms of what he’s bringing to the table and all of the sudden he’ll make a play and bring your focus right back to what all the talk has been about. Current assessment: As one who advocates patience and not rushing prospects into the fray so to speak, I would not be at all surprised if the Bruins try to coax JFK into turning pro right away. With Bergeron and David Krejci about to both be on the other side of 30 (Bergeron turns 31 in July, Krejci hits 30 late next month), the B’s need to get another quality center into the pipeline sooner rather than later, even with the success Ryan Spooner is enjoying this year. That’s probably an alarming prospect to the BU team and its fans, and I won’t say that it’s a done deal by any stretch, but I have been hearing a lot of positive buzz on JFK this year and because he plays that position that the B’s could have a developmental opening for in Providence next season, it would makes sense from an organizational standpoint to see that push come when the NCAA season is done. Bottom line- Forsbacka-Karlsson is mature and plays a refined enough game that he could make a seamless jump to pro hockey now, but if the team and player feel it is in his best interest to return to school, he’ll be the top center and a good bet to take it to another level in 2016-17. Either way, he’s a top prospect who may not have a huge NHL ceiling in terms of offense, but is the kind of forward who will play for a decade-plus and bring consistent production and the kind of 200-foot play that a winning foundation is built on. It was a tale of two seasons for Boston’s top choice in 2012, but Malcolm Subban was playing the best hockey of his professional career when a shot in warmups hit him up under the mask and fractured his larynx. That serious injury will end up costing him more than two months of the season, but the team and its fans should be encouraged by what he put together in December and January before suffering that personal misfortune. Always a brilliant athlete whose physical prowess in the net was clearly on display, Subban’s development has been steady and methodical because he came to the position late after years on defense and needed significant coaching on technique. He’s come a long, long way since the draft and is on the cusp from establishing himself as an NHL regular in Boston with the backup spot up for grabs next season. I’ve always admired how explosive his movements are in net- Subban’s pads are some of the quickest in pro hockey and can be tough to beat down low when he’s able to keep his legs horizontal and seal the posts from east-to-west. He’s always been one who plays deep in his net, and the good news is- he has the athletic ability to get by with that, even if he’s been consistently coached to play out at the top of the crease more and improve his positioning to reduce shooting angles. When you play along the goal line, your margin of error goes down, so this is something that Subban has continued to work on. His glove is has shown significant improvement since he turned pro for the 2013-14 season, and Subban has all the tools to not only make the NHL, but establish himself as a starter at the highest level eventually. He battled through a LBI that cost him the month of October to start the AHL’s regular season and was rusty when he got into the Providence crease for November. Things went from bad to worse, as the focus seemed off and his statistics- especially the save percentage plummeted down near the bottom of all AHL goaltenders. There were whispers about the attention to detail and willingness to work at addressing the flaws in his game and things seemed to snowball. To Subban’s credit, however, he righted the ship in December and earned the trust of Bruce “Butch” Cassidy and Kevin Dean in Providence- getting the bulk of starts and rolling off some impressive victories in both December and January. Just as he had truly seized the No. 1 job in Providence for the first time in three pro seasons there, he took the shot in the throat in Portland and has been on the shelf since, opening the door for Jeremy Smith to return to the PB’s. Both Smith and Zane McIntyre have done a good job of keeping the good times rolling. Current assessment: Subban is maintaining a good attitude about the injury and the corresponding rehab, which required surgery and established an eight-week minimum timetable for return around the beginning of April. It’s unfortunate that he’s had to take a step backwards, but the Bruins can afford to be patient given that Providence is getting good goaltending from Smith and McIntyre right now. Back when Boston signed Tuukka Rask to his big ticket extension, a lot of folks engaged me wanting to know when the B’s would trade Subban. I think this injury should serve as a reminder of the importance of goaltending depth in any organization. Just because you have an established No. 1 like Rask does not mean it is mutually exclusive for a player of Subban’s potential to succeed in Boston as well. While that won’t preclude the Bruins from entertaining offers for him if they come in, it would have to be about value and given the elite-level showing Subban brought before his injury, he looks to be ready to take that next important step next season as Rask’s backup. For now, we’ll wish him great speed and success in his recovery- it will be interesting to see how the long layoff affects Subban and how slowly he’s integrated back into the lineup when he returns. But, after two mostly up-and-down years in the AHL, he’s finally really turning the corner and establishing himself as the player Boston thought enough of to pick in the first round for only the third time in the team’s history (Evgeni Ryabchikov was the first in 1994 and it wasn’t pretty; Hannu Toivonen in 2002 at least brought Carl Soderberg in trade, but the track record in net for 1sts= not great). 3) Must be drafted or signed by a professional club. The last part is key- because there are a few undrafted/unsigned guys out there you could certainly make a case for, but not for this exercise. Not surprisingly, Connor Hellebuyck of the Winnipeg Jets tops the ranking. This former UMass-Lowell star posted a very good rookie season with the St. John IceCaps last season, leaving a big hole on the RiverHawks’ roster after two seasons and a Mike Richter award in 2014. He and former Bruins prospect Mike Hutchinson are going to be two huge goalies in the Jets crease who both give shooters very little to shoot at, but Hellebuyck’s upside appears to be enormous (no pun intended). I admit it- I was a tad surprised that Malcolm Subban was No. 2 overall on the list…not because I don’t think he doesn’t deserve to be there (he does), but because every time I say something about him on Twitter, I usually get several tweets from people “in the know” who tell me Zane McIntyre has surpassed him on the B’s prospect depth chart. I don’t bring this up to slight Zane- as you will see, he’s featured prominently on the list as well. But seriously, folks- Subban is one of the best pure athletes in all of hockey. This is a critical year for him, because his first two AHL campaigns have brought him to a bit of a crossroads- more was expected of him last year, but journeyman pro Jeremy Smith cut into the planned playing time for Subban by performing more consistently. As my friend Mick Colageo of the Bedford Standard-Times points out- Providence bench boss Bruce Cassidy said late last year that Smith had a “B” game when his “A’ game wasn’t working…and that’s why Smith got the nod in the playoffs for the one-and-done P-Bruins. The save percentage totals are solid, no question. Where Subban has gotten into difficulty is with sustaining high level performances without mediocrity and poor starts slipping into the mix. He can be dominant one night, barely average the next. And that’s where Cassidy’s comment about Subban needing to develop his “B” game (read: playing just well enough to give the team a chance) comes in. You can criticize Subban for his inability to seize the starting job in Providence to date, but that ignores the fact that Niklas Svedberg and Smith posted strong seasons to earn the bulk of the starts, as opposed to Subban playing poorly. Make no mistake, though- this is the year for him to take charge of the crease (assuming he’s not playing in Boston) and assert himself. He’s far too talented not to do that in my view. The article reminds us that Subban did not even start playing the position until an advanced age (13), which is why his athletic ability is so important. When he was drafted 24th overall in 2012, to say that his technique was a work in progress was couching it in pretty generous terms. I was an outspoken critic of Subban’s in his draft year (and at some humble pie at the draft because I was so sure the Bruins *wouldn’t* draft him) because I felt that if he wasn’t the younger brother of a certain NHL defenseman and (since) Norris Trophy winner, he would not have gotten the attention he did. Well, close enough…he’s two days away from turning 23 so there’s that, but the Bruins chose him in the sixth round five+ years ago knowing he was a long-term project and they’ve carefully cultivated and developed him since then. I can’t say enough about how far he’s come from that gangly, raw goalie I saw at Bruins development camp right after Tyler Seguin came to town. Like Subban, McIntyre (who went by the last name Gothberg back then) had holes in his technique that he’s worked hard to address, namely in his lateral movement- opening up holes that the more adept shooters were able to exploit by being patient and waiting for those openings. He’s become a far more composed goaltender, although his style is still reminiscent of Tim Thomas in the way that he’ll battle hard and extend himself to get any piece of his equipment on a shot as opposed to the more mechanical and fundamental of butterfly goalies who square up and maximize their economy of movement. I maintain that what McIntyre brings to the table best is his mental toughness- he’s the rare player who has thrived alternately as a backup in junior and the NCAA as well as a starter. When you look at his statistics going back to his first USHL season with the Fargo Force in 2010-11, he’s been remarkably consistent, whether playing a full workload or getting into games on occasion. He earned that league’s top goaltending honor in 2011-12, and then had to work his way back up with the University of North Dakota in 2012-13. By the following year, he won the battle for No. 1 and in 2014-15, he played every game on the schedule, winning honors as the top NCAA goalie and finishing as one of three finalists (to Jack Eichel) for the Hobey Baker Award as college hockey’s premier player. All of this is not to say that I believe it makes sense for him to be the Boston backup this season. McIntyre has said that is his goal and I know he believes that with all of his heart. Hey- anything is possible…but would opening and closing the door for the Bruins skaters to the tune of 60+ games of Tuukka Rask next season be in McIntyre’s best interest? I get it- people are excited about him and understandably so. But this is a player with a grand total of 0 minutes of pro experience at any level let alone the NHL. So- rather than push for the shiny new toy, doesn’t it make sense to allow him the opportunity to play his way into a comfort level starting with the AHL and see how he does? I still rank Subban ahead of McIntyre on the Boston depth chart, but it’s extremely close. In fact, the gap between them has closed so significantly that I would not at all be surprised if when the dust settles, McIntyre ends up being the longer term option. But for now, Subban’s pure ability/projected ceiling and the fact that he’s entering his third pro season gives him the slight nod over the Minnesota native who once won the Frank Brimsek Award as the top high school goalie in the Land of 10,000 Lakes- Mr. Zero’s home state. At 38, Boston’s newest prospect in net checks in- a pretty solid debut. Daniel Vladar went in the third round, 75th overall, and while I felt they could have gone with someone else there (I was higher on Matej Tomek who went at the end of the round to Philly), there is no denying that this Redwood in net has some impressive albeit eventual, very eventual potential. 3. Ilya Samsonov, Capitals- Yep. If you’re not going to have many picks in a draft, get yourself someone with All-Star potential and that’s precisely what the Caps did. Of course- with Braden Holtby playing so well, they have nothing but time to bring the big, smooth Russian along at a leisurely pace. My guess is he’ll be knocking at the door to the Verizon Center before too long. 4. Eric Comrie, Jets- Between Comrie (a value pick in 2013 because of injuries) and Hellebuyck, once again the Jets are building one hell of an organization. They were on the cover of the 2015 THN Future Watch for good reason and then went out and had another hellacious draft in Sunrise. They have premium talent at every position and this fundamentally superb player who is on track after getting a hip issue in his draft year under control is a legit stopper. 10. Jon Gillies, Flames- Man, what a gamer. One of my favorite New England-area prospects of all was so good when he had to be last spring, leading the PC Friars to their first-ever NCAA championship. He’s so big, but was knocked for his overall athleticism in his draft year. To be honest- he’s such a competitor that it’s never really been something I think prevents him from being a success, but it’s a whole new shooting match in the pros, so it will be interesting to see how he develops now that he’s signed and in Calgary’s farm system. I wouldn’t bet against him. 12. Thatcher Demko, Canucks- A wonky hip complicated matters for the talented Californian who soldiered through it in the midst of a disappointing year for Boston College- no Beanpot, no Hockey East title, a quick exit in the NCAA tourney. Demko is another prototype big guy who takes away a lot of net and finds ways to make the big save. A project player several years away, but a good one for Vancouver. 18. Alex Nedeljkovic, Hurricanes- The American playing in the OHL goes against the grain in terms of possessing average-to-below-average size for the position by today’s standards, but he’s a stopper who thrives when under pressure. I liked him a lot in the 2014 U18 championship run to get USA back on the gold medal platform, and he’s got some long-term upside in Carolina. 28. Colin Stevens, Panthers- Undrafted free agent led Union to the 2014 NCAA championship and I was impressed with him when watching him years ago with the Boston Jr. Bruins. The New York native has always brought an impressive mix of size, quickness and the ability to steal games. Winner. 46. Matej Tomek, Flyers- I got in to see him multiple times live in the NAHL last year and I personally feel that the Slovak and heir apparent to McIntyre’s vacated crease in Grand Forks would have been a better choice for the Bruins than Czech rival Vladar. Nothing against Darth Vladar- I didn’t see him other than on film at the U18 (and he didn’t have the greatest performance there) But in my mind- Tomek is the sleeper- underrated and underappreciated, but Flyers fans will soon be like the people at Cheers- they’re going to know his name.